This free resource pack includes one choice board menu related to whole number operations. To complete this board, students will need to complete all of the activities in a row, column, diagonal, or the four corners. The pack also includes additional materials needed to complete the board, including a Cover Up game, a tiling task (with reproducible tiles), detailed directions and materials for product creation, recording sheets, project templates, and a “Free Choice” proposal form. 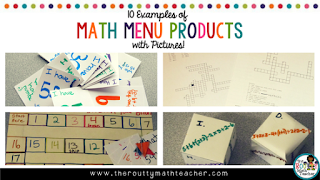 Head on over to The Routty Math Teacher website and read, “10 Examples of Math Menu Products with Pictures” where I share examples of my, and my students’, favorite math menu products. Read the post here or by clicking on the image below. 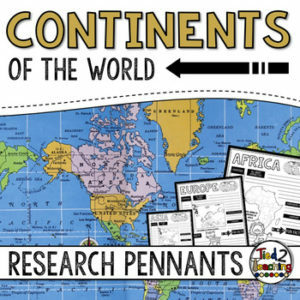 These Continents of the World Research Pennants come with 7 pennants for researching each of the continents. Perfect for any time of the year, these pennants are a great way to supplement your social studies instruction as well as help your students organize their research. 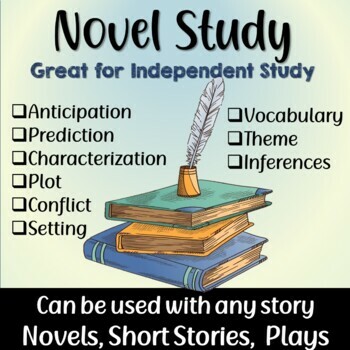 Save time by integrating your social studies and ELA instruction! In addition to being excellent informational organizers for your students, these continents pennants are great to use for bulletin boards or hallway displays. This continents of the world research activity will have your students begging to study our world’s geography! Enjoy these as my gift to you! Wishing you and your students amazing learning experiences this year!